Possibly the world�s most lavish leather conditioner! New formula is thicker and absorbs faster into the leather. The scent has also been revised to provide more of a natural leather fragrance. Once you have the pleasure of sinking into a soft, leather seat, its hard to imagine going back to cloth upholstery! The way leather conforms to your shape and warms to your touch is pure luxury. That�s why Pinnacle Leather Conditioner is such a necessity; it preserves the supple texture of your leather interior for the long road ahead. The VOC compliant formula in our Leather Conditioner is rich in lanolin and natural oils. These oils absorb into the leather�s pores, replacing its natural oils that were lost through processing and subsequent cleaning. Hydrated leather retains its softness and resists cracking caused by overexposure to the sun. The lanolin acts as a natural moisturizer for the hide, just like it works on human skin. Your leather will be left with a soft, satin glow, just like new leather. Leather Conditioner will preserve new leather and rejuvenate older leather that has become stiff. Because leather is a natural skin, it is sensitive to many of the same things as our own skin. Alkaline products will dry it out and cause premature aging. Leather Conditioner contains no petroleum distillates and will not dry the leather or its stitching. With a neutral pH rating of 7, it perfectly matches the natural pH of leather. In addition, Pinnacle Leather Conditioner contains a strong UV protectant to shield your leather from the harmful effects of the sun. Use Pinnacle Leather Conditioner on vat-dyed or surface-dyed leathers. Do not use on napped leathers like suede, or on glove soft leather. Leather that has cracked from age or neglect cannot be restored with this or any other known product. With proper care, your leather will retain its sumptuous texture, appearance, and scent for years. Nourish your leather with Pinnacle Leather Conditioner! This product is not recommended for napped suede or glove soft leather. Leather that has cracked from age or neglect cannot be restored by this or any other known product. Wipe away excess cleaner with a clean, dry microfiber towel. Allow the conditioner to penetrate for several seconds and then buff with a clean, soft microfiber towel, such as the Cobra Microfiber Detailing Cloth. 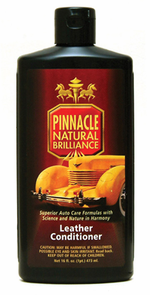 I have used a few products over the years and Pinnacle Leather Conditioner smells new leather. Not a chemical or a perfume. I am not going to say it conditions better than other products but it conditions as I would expect. It is my go to conditioner. Been using it on BMW Nappa leather and I love it so far. It gives a pleasant leather smell without being too strong. The conditioner works its way in to the leather very quickly and there's not much residue to buff off. Leaves the surface with a nice matte finish. The leather is a tad slippery after a fresh application but not too bad. UV protection is a nice bonus as well. Durability is around a month based on smell and feel. My bottle of Pinnacle Leather Conditioner arrived with a crack in it and much of it had leaked into the interior of the shipping box. However, the box it was shipped in showed absolutely no damage.